Registration opened with a boom with 30 women registered in the first week! I saw some familiar names and some new names on the list. My favorite part of this annual event is making real life connections with the amazing women of this program. We are a pretty awesome bunch. Quite a few women have stepped up to volunteer to lead informal activities on Thursday and Friday before the official conference kicks off. Volunteers are also starting to step up to help with wake-up and wind-down activities. There are still a few slots left, so let us know if you want to coordinate a morning jog, evening meditation, or anything in between. Together, we are making this conference one to remember! Also, I made some progress in my plans for a super fun surprise at the event… you will just have to show up to find out what it is! Total collected so far is $1,190! Keep checking back on the WFS Online forum Everyday Living category for weekly updates and watch that fundraising thermometer fill up. 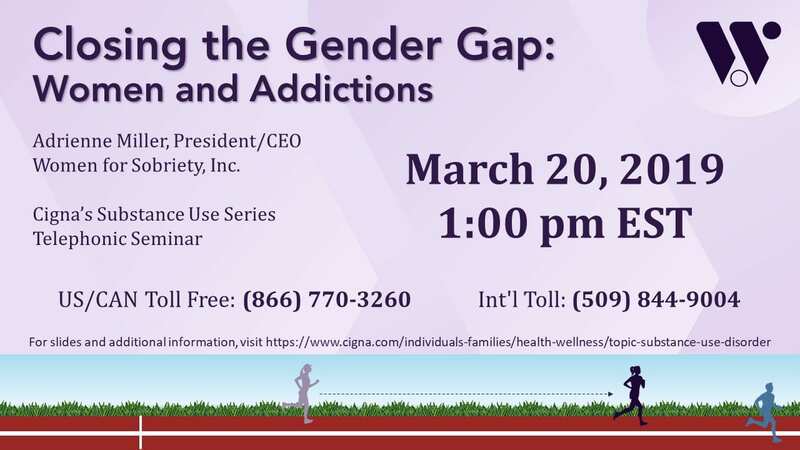 Don’t forget to set a calendar reminder for Wednesday, March 20, 2019 at 1:00 pm EST for my webinar, Closing the Gender Gap: Women and Addictions. It used to be that men were significantly more likely than women to experience problems with drugs (including alcohol). However, these differences are quickly diminishing. We will explore how and why these numbers are changing, as well as how gender-specific needs of women can be addressed in recovery. Attendance is by telephone, so no need for any fancy software! Simply call the number provided on the Cigna Substance Use Disorder web page.